Every breeders who burn with passion to Akita dog's contests feel strongly that is difficult to give birth excellent Akita dog. There are some type's breeders who breed Akita dogs though put in field of view the contests. The breeders who put their hearts to make good face, make good color, make good balance or aim total degree of perfection. There are dilemmas that many breeders encounter. For example the Akita dog's face is fine, but other parts aren't good. And good color but, good balance but…. A big veteran says who lives in our home town,"Even if you will breed Akita dogs throughout the entire half a century, it will be difficult to give birth truly excellent Akita dogs. So Akita dog is profound". 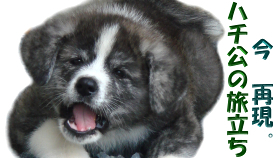 For example Japanese breeders say "Tora"=black and white line color= is sometimes breeded with Akita dog of redcolor to make good face. There is a possibility to make the face peculiar red Akita. But there is a risk that will be bad color. There are the standard color of Tora, strong black keynote "Kuro Tora", marbling type "Shimofuri" and mixed red color except the belly "Akatora". It is not be able to get the victory by only fine good Tora design. It have to be endowed with other good parts. If the Tora's abdomen isn't white color, Some of veterans say "Gomitora". It is the meaning "Tora of dirty color" as destroying value of Tora. And the Tora will be defeated in Akita dog's contests. If you don't hope to give birth "Gomitora", it will be better that you will breed white Akita with Tora one times in the several generations. Basically, red Akita dog's face is better than Tora and white Akita dog. So some breeders who have Tora or white Akita dog try to breed with red Akita dog to give birth the Akita dog of good face. If it will be breed among red and red or red and white, the white puppy will be high probability to give birth with the face of red Akita dog. But the breeders have to prepare themselves that the puppy will give birth with little cumbersome color in the body. If you will breed white and white, white and Tora, Tora and Tora, the giving birth white puppy will be a high probability of pure white. But if the white puppy was given birth based red Akita dog, it will be a high probability thinly red color into the edge of ears, head or back. By the way, we'd like to explain little about the nose's color of white Akita dog. The nose's color of white Akita dog will be reddish‐brown finally. It is typically that will be changed with slowly to reddish‐brown even if given birth with black nose. Of course sometimes happens that white puppy with black nose in per life will be born with low probability. However, it is not necessarily something that white Akita dog with black nose can get the victory in the contests. The big veteran breeder who lives our home town explain about the nose,"The nose's color is just black by breeding red Akita and red one. If we breed red Akita and red one or red Akita and white one, sometimes happens that white puppy will be born with black nose". 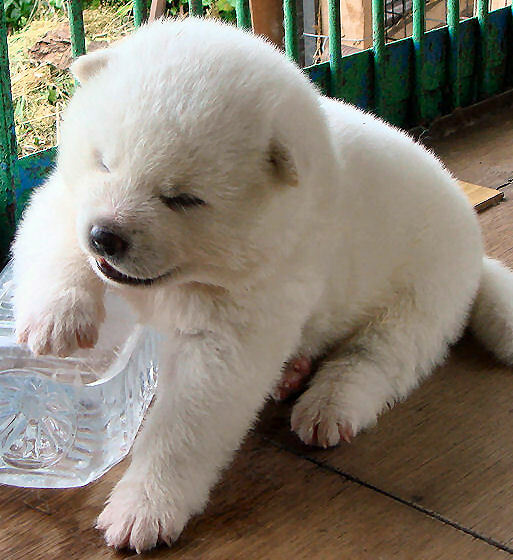 When it comes to the white puppy giving birth from red Akita is unlikely that has pure white color even if having black nose. But there are pure white puppy giving birth with black nose in rare cases even if red color's breeding. It might be under 0.1% such the white puppy. But even such the white puppy can't get the higher-ranking in the contest in so much that the puppy has good parts more. After all, only one of Akita dogs who has all best face, color, balance, etc can get the victory. There are 2 paterns about the vicory. 1 case is that the breeder put his heart into giving birth. And another case is a godsend. If it is a godsend, it can hardly to give birth excellent Aita dog to next generation. Therefore it is so difficult just like thread a needle into the dark that we give birth Akita dog for making everyone groan. So it will be desired endless effort, perseverance, deep love for Akita dog and the enthusiasm with our entire life. He is the white puppy. It isn't rare black nose when he is puppy. He is the adult white Akita dog. His nose color is reddish‐brown. 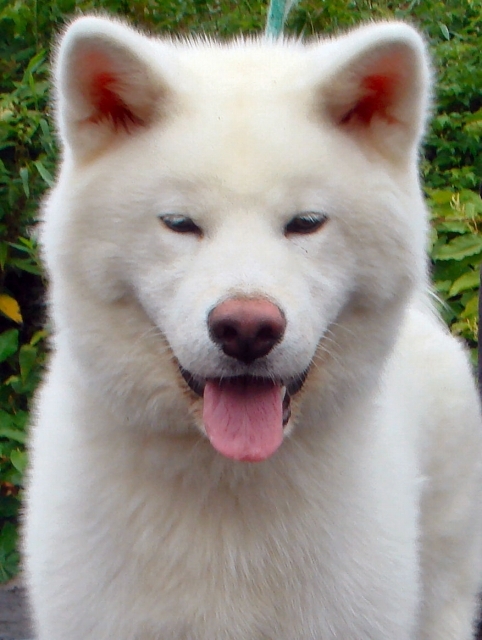 It is standard color of white Akita dog. His nose color was black when he was puppy.